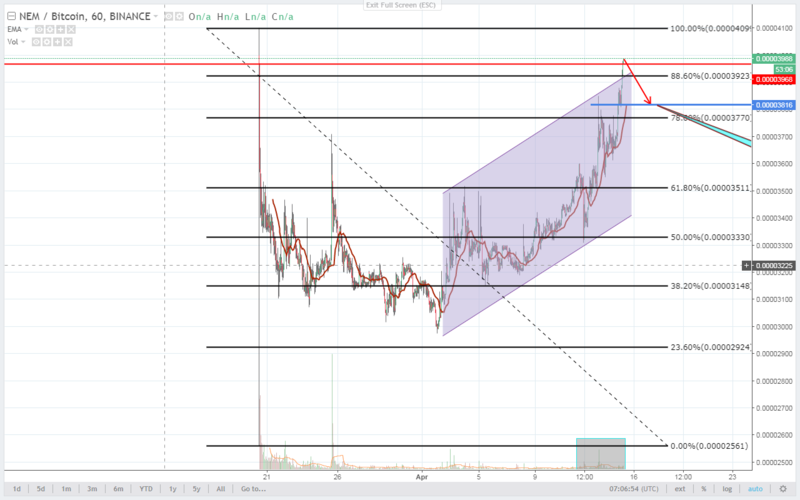 I am looking for a good coin to day trade and to be given as a signal for my Free Signals Channel on Telegram, then XEM (NEM) caught my attention because it has been uptrend for days now, since April 2 after a bounce from 0.00002985 area, its movement has been an uptrend and now it is 0.00003800 area and is still on its uptrend movement. Technical analysis part: its RSI (Relative Strength Index) is really good and still showing good strength even in its mini drop and still has a big room to grow, before reaching the overbought area. 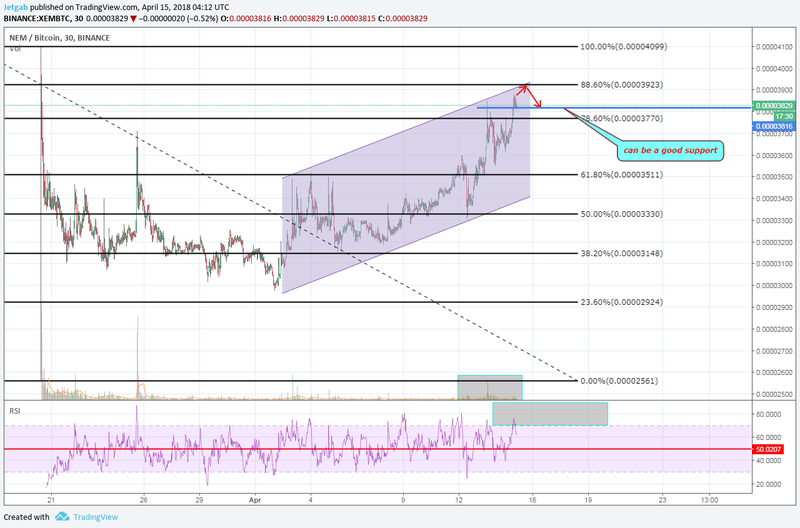 Currently it is approaching the 88.6% Fibonacci level (0.00003923 area) which can be its PRZ (Potential Reversal Level) and it may retrace down to my found support at 0.00003816 area then bounce back up again and from there it may break the 88.6% Fibonacci level if the strength will be good. As a day trader I critically analyse all my charts and trades, and also the trade calls that I give to my Free Signals Channel because even if they are trading at their own risks by following my trade calls, the money that they are betting in my trade calls maybe their hard earned money, and the main aim of my channel is to help them win trades not just to brag about my charts and give them a low quality trade calls. Legal disclaimer: I am not a financial advisor nor any content in this article is a financial advice, buy and trade at your own risks. my analysis is based on my view using technical analysis and market behavior. Hi, I @dekteng I have followed you. here is the result, it did not retrace at the 88.6% Fibonacci level, but it will somehow retrace before it reaches the 100% level if possible.